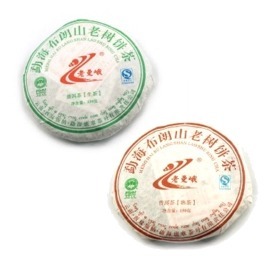 Menghai Bu Lang Shan Pu Erh Tea Cake is a smaller compared to the normal 357 grams tea cake. This Menghai Bu Lang Shan Pu Erh Tea Cooked or Green Cake is only 150 grams. The tea leaves are specially made of the leaves well chosen from organic tea garden in Bulang mountain, Menghai County side and strictly followed the Organic Food Law. This tea had a great full taste that leaves a distinct aftertaste of great Pu Erhs, it has a very delightful flavor. Menghai Bu Lang Shan Pu Erh Tea Cake comes in 2 types; Green and Cooked.